Unbeknownst to Michael Dillinger, his part-time gig guiding tourists in the Big Apple would turn into a full-time career he loves. Seven years ago, Michael Dillinger was in search of a way to make some extra money so he chose to get licensed as a tour guide in New York to show visitors around his home state. Little did he know, giving tours would be the most fun he’d ever had working any job. “The city that I’ve been in my entire life, I get to see it through their eyes,” he says. “I get to experience it new every time." Fast forward to today Dillinger, who serves as the vice president of the Guides Association of New York City (GANYC), has turned that second job into his full-time profession. Now, he not only spends his days giving tours of New York, but he also travels to places like Prague and elsewhere, to see how the industry has evolved. The travel and tourism business is one of the largest industries in the U.S., generating $2.1 trillion in 2014 and supporting eight million tourism jobs, according to the U.S. Travel Association. Although pay may vary considering a large number of tour guides are independent contractors, says Dillinger, the average salary ranges from $35,000 to $51,000, according to PayScale. In search of extra income, Dillinger thought combining work as a tour guide with his wife’s catering company seemed like the perfect combination. After finding success, Dillinger thought it was time to offer tours full time. Prospective tour guides need to pass an exam, administered typically by states, cities and municipalities to get licensed. Dillinger’s was 150 questions long, covering everything from ethnic food, architecture, history, art, and even rules of public transportation. “There’s a whole lot of things they expect you know,” he says. From there, he’d visit websites like TripAdvisor in search of tour companies before reaching out in search of work as a licensed independent contractor. Being a tour guide isn’t just about pointing out landmarks and spouting historical facts. Throughout any tour he gives, guides need to be constantly aware of unseen logistics. If he’s not on his toes, so to speak, he could face being slammed in a bad review online. Dillinger says these reviews are of the utmost importance. A bad review can be the difference between working and not working. Thus, being knowledgeable, fun and accommodating is essential, he says. Guides should have a knack for performance and storytelling—but most importantly, they need to think on their toes and react to change because things are always changing, says Dillinger. Simply put, finding work. As an independent tour guide, the onus is on the individual to go out and track down the opportunity. This also requires you keep good records of your income for tax purposes, which can be daunting and requires good organizational skills. 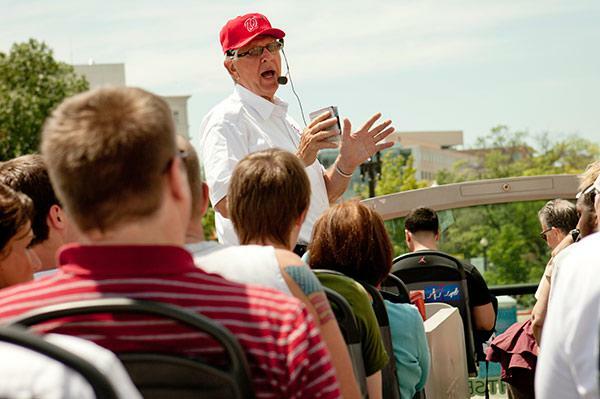 If you’re looking to see if being a tour guide is the right fit for you, Dillinger’s advice is to immerse yourself in the profession by taking as many tours as possible. Find tour guide jobs on Monster. Top 10 cities leading job creation in the U.S.